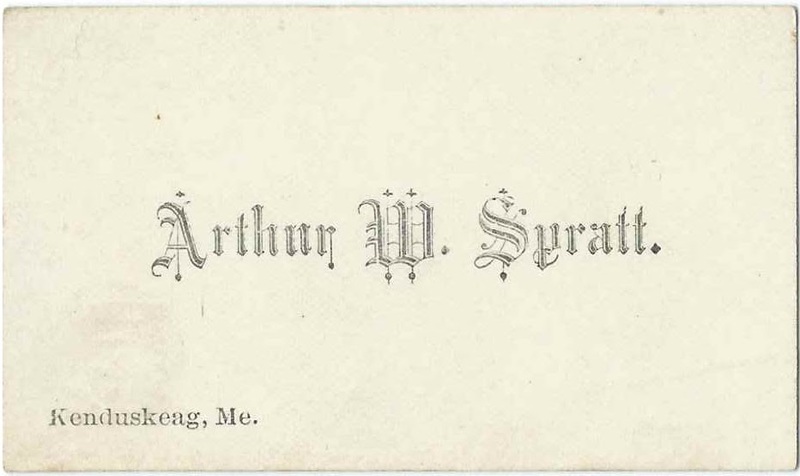 Calling card of Arthur W. Spratt of Kenduskeag, Maine. Arthur was presumably Arthur Warren Spratt, born April 6, 1860 at Kenduskeag, Maine, son of William Cooper Spratt, or William Cowper Spratt, and Christiana Libby (Crawford) Spratt. On December 23, 1882 at Kenduskeag, Maine, Arthur married Elizabeth S. Dunfee, "Lizzie", daughter of John and Betsey Dunfee. Arthur, an engineer, and Lizzie lived in various towns in the area: Bangor; Exeter; Corinth and had several children. Arthur died in 1936 and Lizzie in 1951; they're buried in the Corinthian Cemetery at Corinth, Maine, with at least one of their children. If you have corrections and/or additions to the information above, or if you feel that Arthur W. Spratt was another person, please leave a comment or contact me directly.